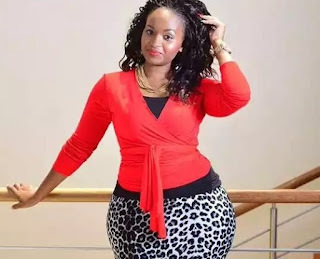 Kenya’s curvaceous media personality who has proved that Hips don’t lie recently came to Njoki Chege’s aid after a section of Kenyan citizens and celebs mercilessly lashed her after she wrote a controversial article ‘dissing’ fat women. Anyway short of it all! I’ve just read @carolinemutoko Article in response to the Infamous Fat Shaming Article & I must say finally what a breath of Fresh air!! Finally a more honest approach! Njoki was rather crude but her opinion is very much valid. Coming from my own honest space… I weighed 65Kg’s before my kids after naturally loosing my teen weight in my early twenties! I then got pregnant at 24! & still managed to maintain a good ratio, though of course as my twins were growing in my belly I gained 14Kilos!! So by 9months I was 79Kg’s!! My heaviest yet! Breast-Feeding did me good though, in no time I was back to my pre-baby weight. 2years in though I fluctuated between 70-73Kg’s! Now though 4yrs later I’m approaching my fears… I’m now at 77Kg’s! And I am very aware of my triggers! Stress makes me crave sugar & fat & I also tend to eat at the wrong times.